The boat trolls along the South Texas jetties and then . . . a hit! The crazy whir of the fishing line is a hint that there&apos;s a big game fish on the other end. Tarpon, mackerel, sailfish, marlin—they&apos;re all here. And an increasing number of offshore fishing enthusiasts are here too, discovering the lure of trophy fish in the waters of the Texas Gulf Coast. If you have big dreams of catching the big fish, then the Gulf of Mexico is your dream come true. In port cities all along the Texas Gulf Coast, offshore fishing charters lure you in with highly experienced guides ready to hook you up with the Gulf&apos;s biggest trophies, including amberjack, red snapper, sailfish, wahoo, mackerel, grouper, shark, blue marlin, and more. Just over one million fishing licenses are sold in Texas each year, so with ours firmly in hand, we headed to a popular coastal spot: Port Aransas, just south of Corpus Christi. A free ferry ride brought us over from the mainland to find a laid-back beach town with lots of shops, restaurants, and a funky multicolored motel called Laughing Horse Lodge. As we drove down the main thoroughfare, we saw kids in line to have their picture taken inside the mouth of a giant (fake) shark&apos;s head that was poised at the entrance to Destination Beach & Surf Shop. As do most offshore charters, Pirates of the Bay provided all the rods and reels as well as the bait. It was a beautiful day, so we slathered on sunscreen, donned our hats and sunglasses, and settled in for the three-hour journey out to sea. We reached the “sweet spot” that Captain Stanford was aiming for, and after a bit of coaching on the tackle and proper casting, the fishing began. A man from Dallas got the first hit, reeling in a long, silvery mackerel. Soon after that, the captain helped a 10-year-old angler land a red snapper that was almost bigger than she was. Throughout the day, the hits kept coming, and at final count we&apos;d caught 32 fish, with the biggest being a 65-pound grouper. Even though the fish put up a good fight, he was a shrimp compared to the current record for a Gulf grouper—126 pounds! To secure my “over-the-mantelpiece” catch, I asked around about a good offshore outfit for marlin and sailfish. Answer? A fast boat with the proper rigging, which began with a chair bolted to the deck—yikes—and a sturdy harness to help me stay in that chair while I fought the fish for bragging rights. 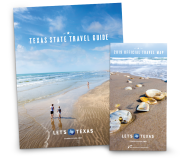 A recommendation led us to South Padre Island, a two-mile slip of land at the tip of Texas near Mexico, known for its white sand and blue water. I discovered it&apos;s an angler&apos;s dream, with great deep-sea fishing as well as excellent coastline catches of redfish and trout in nearby Laguna Madre. After consuming a big bunch of breakfast tacos at Grapevine Café and Coffeehouse, we met our guide, Captain Mike Walker of Salt Walker Charters. We boarded the 45-foot Carolina Sportfishing boat powered by a 670-horsepower engine and cruised along at a crisp 18 knots (about 20 miles per hour). Walker noted that from the Upper Coast it might take as long as four hours to get out to trophy-fish territory. From South Padre, however, we were there in two. The lines went out, and I didn&apos;t have to wait long before I felt a considerable yank. Thankfully, I was strapped into the rigging, my line screaming out as the sea monster took off. Captain Mike and his crew helped me begin reeling it in. Ten minutes later, the blue marlin crested for the first time, wrangling side to side before diving back into the water. When we finally landed it, almost an hour later, we found the blue was eight feet long and weighed 250 pounds. You can bet I&apos;ve been bragging about that ever since. A wide range of offshore fishing charters operate in port cities all along the Texas Gulf Coast, varying in cost, length of trips, and type of catch. 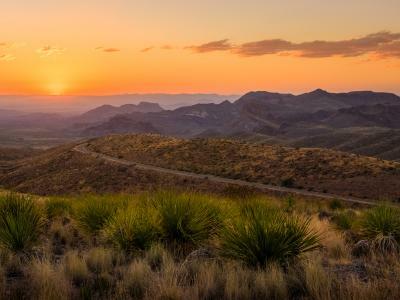 From a larger city like Houston, you can drive about 90 minutes east to Port Arthur, or 45 minutes south to Galveston Island, both of which offer plenty to do when you&apos;re not fishing. Take a walk along the Seawall, or amuse the kids with a trip to Pleasure Pier. Rockport, about 45 minutes from Corpus Christi, has some great charters as well as the World&apos;s Largest (fake) Blue Crab, measuring 27 feet from back fin to front claw. It has been quite a while since the biggest catch record for the Texas Coast was broken. That title still belongs to Chap Cain III, who caught a 1,128-pound tiger shark back in May of 1992. The shark was 162 inches long and was pulled straight out of the Gulf of Mexico. It&apos;s time for a new champion, so get your nets ready for some record-breaking catches.